The Dillon store on its opening day. On paper, the deal that helped bring REI to Dillon last fall begs one question: Why would a 900-person ski town offer a $600,000 tax rebate to a national company that brought in $2.56 billion last year? 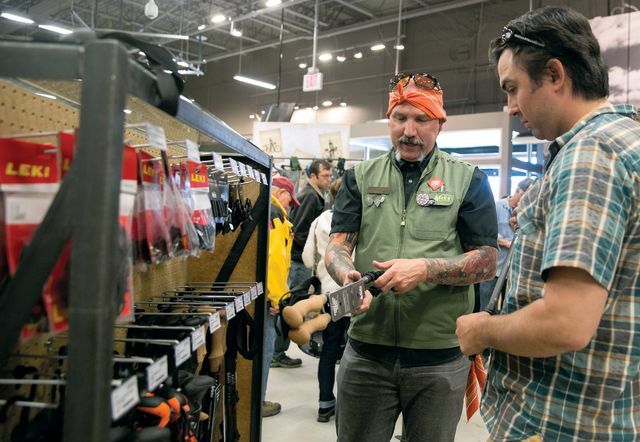 REI's Carlos Santos assists a customer with questions about trekking poles. Such was the incentive that Dillon offered to woo REI, which opened for business in early May, in the big box store vacated by Sports Authority last year. That money, the retailer says, made the site attractive because it covered the cost of renovating the location. 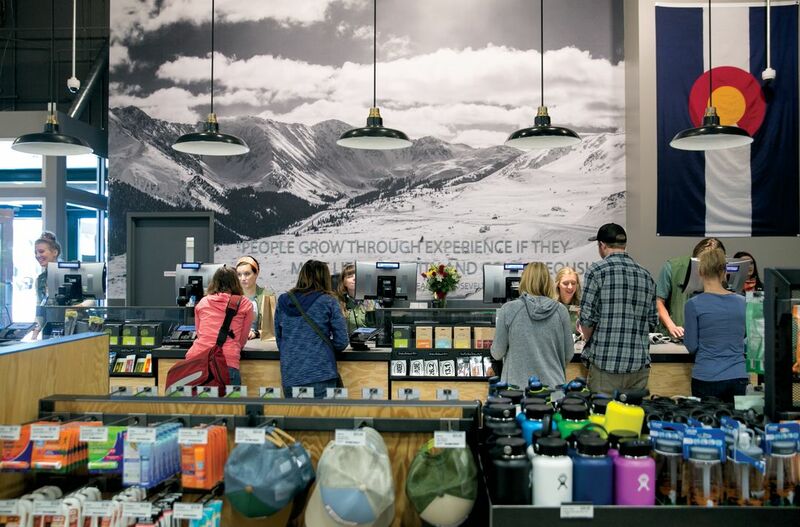 The justification, from the town’s perspective, is that luring the country’s most popular outdoor gear store to an outdoor recreation mecca like Summit County should generate more sales tax over the next decade, which is how long REI’s lease runs. 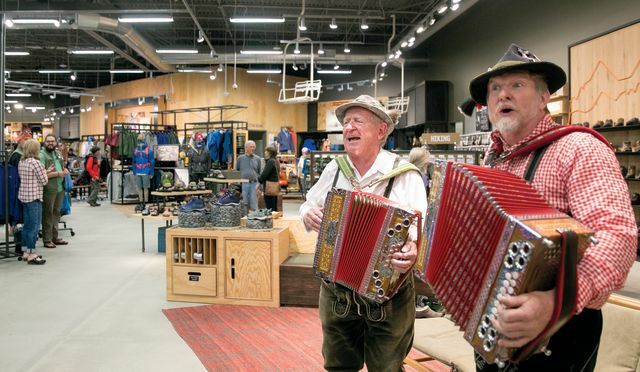 Yodelers Helmut Fricker and Gerhard Rill entertain shoppers. The Dillon store is REI’s 148th location and its 9th in Colorado. It is the first of four stores the renowned co-op plans to open this year, along with hubs in Florida, California, and New York. It is also the first REI store to open in the mountain region (Idaho, Montana, eastern Washington, Colorado, and Utah) in nearly a decade. Summit represents a smaller-than-usual market for REI, Odom says, but the co-op counts more than 8,000 members in the immediate area, which helped justify its opening. In addition to locals, Odom also expects to draw customers from Steamboat Springs, Eagle County, and Leadville, as well as destination travelers. 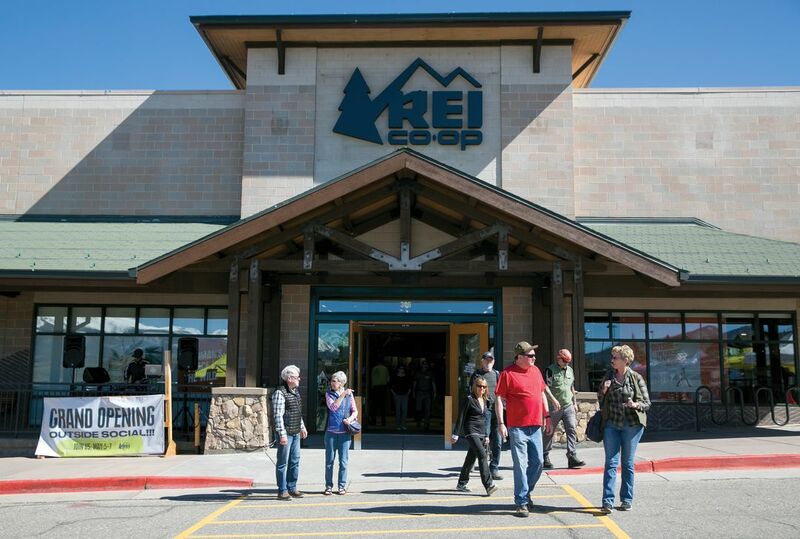 REI’s membership exceeds 16 million nationally, and members get a 10 percent dividend return on every dollar they spend at the store each year, hence the “co-op” designation. Customers at the REI in Dillon. The Dillon outlet, with 14,000 square feet of bright, open floor space, is less than half the size of REI’s Denver flagship. But that footprint also includes community room for twice-weekly events and presentations, and the ski-tuning and bicycle repair shop is much larger than normal for a store this size, Odom says. In addition, the Dillon store will be one of two REIs nationwide to rent Alpine skis and snowboards next winter, along with Salt Lake City. REI’s impact stretches beyond its buzz. Odom says she received 500 applications to fill 40 positions and ended up hiring locals for about 80 percent of the jobs. The company’s history of donating to nonprofits bodes well for local organizations. And considering how often Summit residents need a piece of gear, whether obvious or obscure, there is the convenience factor.